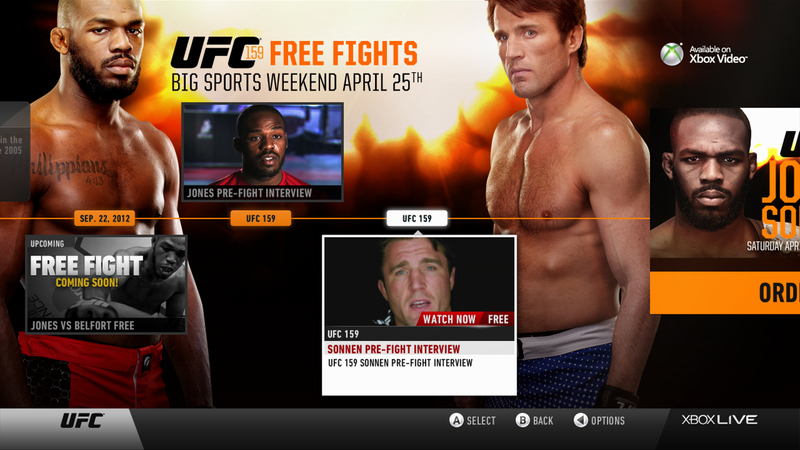 Watch all 7 UFC Fight Story fights in preparation for Saturday’s big UFC 159 Pay Per View fight between Jon “Bones” Jones and Chael Sonnen on Big Sports Weekend LIVE on Xbox. Win Big Sports Weekend Giveaway of NFL Draft, UFC 159, MLB and NBA on Xbox LIVE. Enter to win the Sports Techie Big Sports Weekend giveaway for a chance to win a free whitelist access pass on Xbox to the UFC 159 Pay Per View fight Saturday, in addition to a free one-month Xbox LIVE Gold membership. The Xbox LIVE Big Sports Weekend begins Thursday April 25th so be sure to enter our Sports Techie Rafflecopter giveaway today. Thank you for sharing this blog with your Xbox friendly family and peers. This weekend (April 25th through April 28th), Xbox LIVE members in the US and Canada will get free access to some of the most popular sports apps on the service – including free live coverage of the NFL Draft on ESPN, more than 50 live MLB games and 7 UFC Fight Story fights. Clear your calendar this weekend and get the Full Sports on Xbox experience with free UFC Fights, free MLB Games, full coverage of the NFL draft and more. During this weekend all Xbox Live members (Gold and Free) have the opportunity to get the best of Sports on Xbox. During Big Sports weekend all sports apps from April 25th-28th will be unlocked for both Free and Gold members in the US and Canada, including ESPN, UFC, MLB.TV, NBA Game Time, and NHL Game Center. Enjoy free access to Sports on Xbox LIVE this weekend. All sports apps from April 25th-28th will be unlocked for both Free and Gold members in the US and Canada, including ESPN, UFC, MLB.TV, NBA Game Time, and NHL Game Center. Watch live coverage and highlights of the NFL Draft on ESPN, catch more than 50 MLB games for free, and watch all 7 UFC Fight Story fights in preparation for Saturday’s big UFC 159 Pay Per View fight between Jon “Bones” Jones and Chael Sonnen. In addition, enjoy highlights, recaps, and clips from the best of the NHL as teams jockey for position leading into the NHL Playoffs, and catch up on highlights of first round clips and highlights of the NBA Playoffs. Enter to win the Big Sports Weekend Sports Techie Giveaway by entering at the Rafflecopter link below. The only mandatory requirement to enter is you have to “like” our Sports Techie Facebook fan page. We thank you in advance for liking our Sports Techie Facebook page. If you have already liked the page, the raffle software has an option for that after you click on the link. I update the Sports Techie Facebook fan page anywhere from 2-6 times a day which is an easy pace. Be sure to look at the picture timeline to fully understand our community that likes Sports Technology. Tune in to ESPN on Xbox 360 during the Big Sports Weekend to watch the entire NFL Draft live. Tune in to ESPN on Xbox 360 during the Big Sports Weekend to watch the entire NFL Draft live. Leading up to the Draft, be sure to tune in to catch all of the insightful analysis of ESPN’s NFL studio shows, great clips and exciting highlights of your favorite team as they prepare for the NFL Draft. 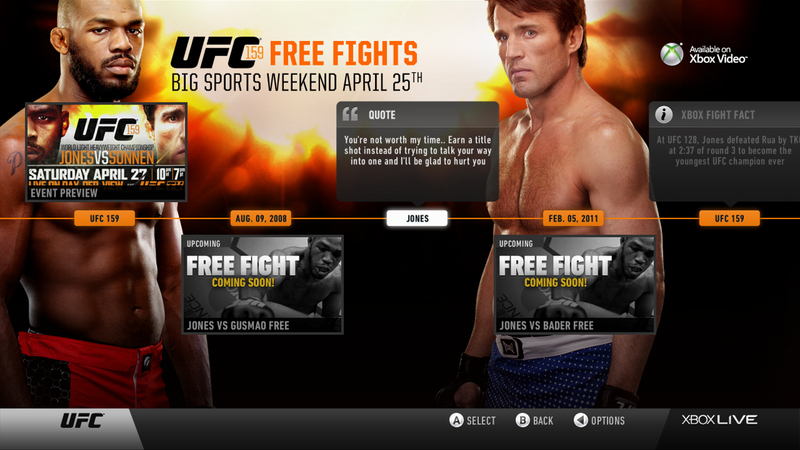 Between April 25 and April 27, get 7 free fights featuring Jon “Bones” Jones and Chael Sonnen as you get ready for the UFC 159: Sonnen vs. Jones main event. As a free member you also get full access to Gold-only features like the weigh-in, fight card, and more. Enjoy FREE access to NBA Game Time. Get free access to the Gold-only NBA Game Time App with full access to clips, highlights, and recaps for the NBA playoffs all weekend. Big Sports Weekend Unlocked on Xbox Live, enter our giveaway by midnight tonight and we will rock one of you with the following prizes – FREE whitelist access pass on Xbox to the UFC 159 Pay Per View fight Saturday, and a one-month Microsoft Xbox LIVE Gold membership giveaway at a Rafflecopter giveaway. Sports Techie, We’ll give the free whitelist access pass on Xbox to the UFC 159 Pay Per View fight Saturday, and the one-month Xbox LIVE Gold membership, tomorrow to a community member. The 2013 NFL Draft begins Thursday, April 25 (Round 1) – 8 p.m. ET on ESPN and NFL Network from Radio City Music Hall in New York City. Be sure to follow hashtag #NFLDraft. Enjoy the LIVE Big Sports Weekend free access to the NFL draft, UFC fights, NBA Playoff action, NHL Playoff hunt and America’s digital pastime, MLBTV games, plus more, all on Xbox. Big Sports Weekend Unlocked on Xbox LIVE, enter our Sports Techie giveaway by midnight tonight and we might rock one of you with the following prizes – FREE whitelist access pass on Xbox to the UFC 159 Pay Per View fight Saturday, and a one-month Microsoft Xbox LIVE Gold membership giveaway at a Rafflecopter giveaway.